Cross-country trekker to return home for MS fundraiser. 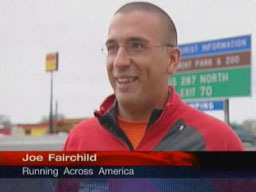 Runner stops in Tulsa to promote multiple sclerosis awareness. Michigan Daily (Ann Arbor, MI) - Front Page! Runner gets daily dose of America. Know any newspapers, televesion/radio stations, or any other media that may be interested in my story? Please forward them this Press Release.